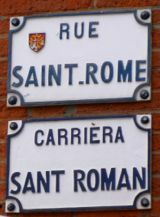 The lively Rue St-Rome is home to many shops. language of the region . If you leave the Place du Capitole on the Rue St-Rome, a narrow pedestrian street lined with red brick buildings, you will find yourself surrounded by shops of all kinds. Clothing stores, blocks of shoe stores, and more provide just about anything you might want to buy. 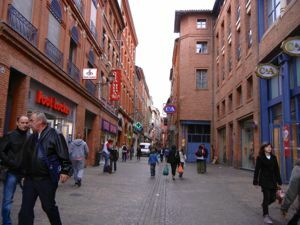 This isn't the only area of Toulouse with shops, but it certainly has a concentration of opportunities. 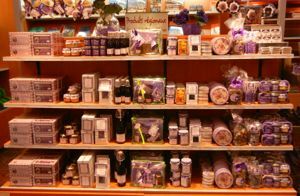 As far as souvenirs go, you'll find plenty of places to buy violet-themed gifts—perfume, candy, and more—as well as gastronomic delights such as paté or confit de canard. Toulouse also offers a number of open markets, flea markets (puces) and brocante (antiques and bric-a-brac. There's a Saturday open market at the Capitole and weekend puces/brocante markets near the Basilica of St-Sernin. Above, Red-brick shops on the Rue St-Rome, Toulouse. Below, An assortment of violet-themed souvenirs.